Welcome to my writing zone. I was sixteen once (above left) and spent all my time writing. From that day to this (right) it’s been the same. I have written letters, postcards, memos, shopping lists, reminder notes and requests. I produced thousands of pages of essays and theses at High School and at University which finally gave me access to an academic career where I had to write articles for journals and chapters for books. All the time I was also writing my own stories, fictional narratives and a daily journal. I kept almost complete journals during my teenage years and again from my mid thirties at various times, including now. I was also fascinated by painting and loved works from the coasts of Arnhem Land and the Australian deserts to the treasures in the great galleries of Europe and the United States. From the start I had wanted to be a writer and an artist. Many things stopped me, not least the need to support three children. So the academic career was a godsend and although it took me away from what I felt I should be doing it gave me a range of extraordinary and unique experiences. All the same as a writer I was trapped in the learned journal. A couple of years ago that life came to an end. “Retiring” they called it, but for me it was the beginning of the work I had been wanting to do. I enrolled in a diploma in visual arts at TAFE which I completed after two years of hard slog and enlightening confrontation with reality. It led me to begin writing about art, at first for assessments and then because I wanted to. My art-writing site partners this one, you can visit it at Annette Hamilton Art Writing from Australia here. Part of the TAFE course included photography, and after finishing the Diploma I did a supplementary course in that. Finally I returned to writing, hoping it wasn’t too late for some kind of “career” in independent publishing. I have had to learn all kinds of things nobody once needed to know to be a writer. One of the hardest has been learning to manage the world of websites, domains, social media and independent publishing. Authorship and readership is not what it was, and entering the writing world I have been inhabiting as a kind of ghostly presence for so long is a real challenge. Writing needs time, but it also needs place. I have been fortunate in having beautiful places to write in. 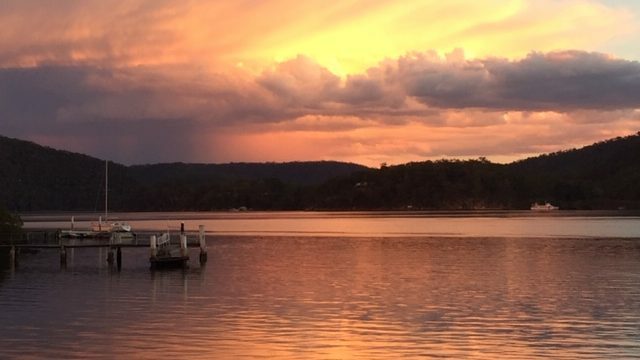 The banner photo above is a sunset view from my house on the Hawkesbury River. Full moon nights are amazing too (below). Time passes and everything changes. I’ve been through a lot lately including a serious illness which put the publications on hold for over a year. But I’m doing fine now and writing better than ever. A book of memoirs and two of short stories should be out soon. I hope they find readers, although my writer daughter says nobody these days will “get” them. After that, I’m going to try something completely different: apocalyptic fiction in a post-millenial setting. The painting and photography are coming on too. Visit my photography site at Annette Hamilton’s Image Field here. A site for my painting projects is still in development. Full Moon on the River, September 2018.